Sarah Nader- snader@shawmedia.com Cary-Grove's Katie Barker shoots during the fourth quarter of Wednesday's Class 4A Cary-Grove Regional against Crystal Lake South February 19, 2014. 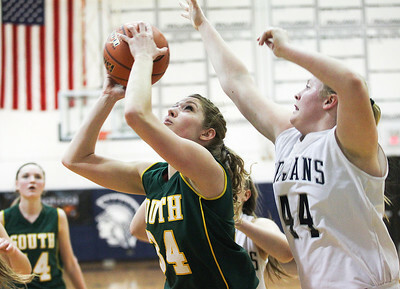 Cary-Grove defeated Crystal Lake South, 57-45. Sarah Nader- snader@shawmedia.com Cary-Grove's Candace Cunningham shoots during the third quarter of Wednesday's Class 4A Cary-Grove Regional against Crystal Lake South February 19, 2014. Cary-Grove defeated Crystal Lake South, 57-45. Sarah Nader- snader@shawmedia.com Cary-Grove's Brianne Prank is guarded by Crystal Lake South's Sara Mickow while she shoots during the fourth quarter of Wednesday's Class 4A Cary-Grove Regional February 19, 2014. 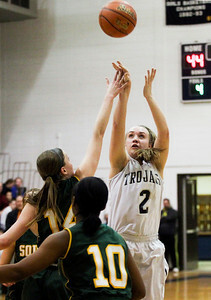 Cary-Grove defeated Crystal Lake South, 57-45. Sarah Nader- snader@shawmedia.com Crystal Lake South's Sara Mickow (left) is guarded by Cary-Grove's Katie Barker while she shoots during the first quarter of Wednesday's Class 4A Cary-Grove Regional February 19, 2014. 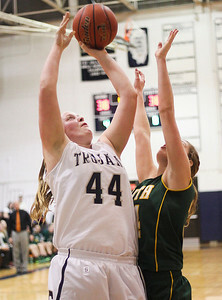 Cary-Grove defeated Crystal Lake South, 57-45. Sarah Nader- snader@shawmedia.com Crystal Lake South's Sara Mickow (left) is guarded by Cary-Grove's Brianne Prank while she shoots during the second quarter of Wednesday's Class 4A Cary-Grove Regional February 19, 2014. Cary-Grove defeated Crystal Lake South, 57-45. Cary-Grove's Brianne Prank is guarded by Crystal Lake South's Sara Mickow while she shoots during the fourth quarter of Wednesday's Class 4A Cary-Grove Regional February 19, 2014. 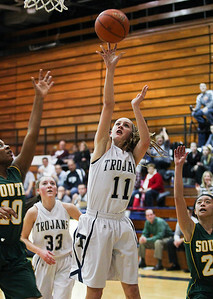 Cary-Grove defeated Crystal Lake South, 57-45.